In December, graduate students from the UNC Department of Marine Sciences spent 10 days transplanting corals on the Mesoamerican Barrier Reef in southern Belize. The data they collect from this research could impact coral reef conservation efforts in the future. The task at hand appears simple: slip a zip tie through the plastic disc, ensure the ID tag is visible, and attach it to the metal table. Cut off the excess plastic. Repeat. Now, do that 48 times, underwater — with a limited amount of air on your back. With a bucket of coral fragments and three mesh bags full of zip ties and rusty scissors, two graduate students from the UNC Department of Marine Sciences methodically go through this process, breathing steadily through their regulators and ignoring the cold in their hands. It’s been a long, but very productive day. They spent the morning collecting corals, then two hours carefully cutting them into pieces, recording their measurements, labeling them, and now they’re putting them back in the water. 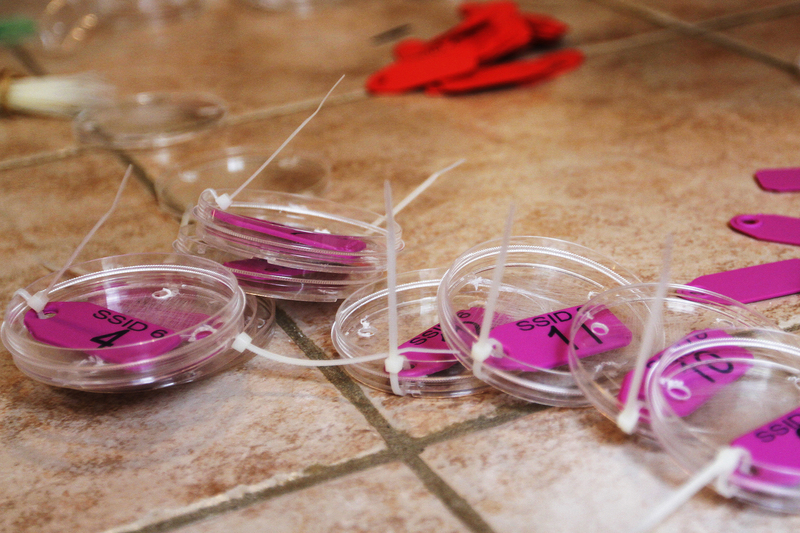 Baumann and Bove created hundreds of ID tags during their week documenting coral in Belize. When the coral is secured, they gather their equipment and head to the surface. After eight hours, their work for the day is done. Back on the boat, Justin Baumann and Colleen Bove wiggle out of our wetsuits and exchange high fives — they just successfully transplanted six colonies of massive starlet coral. Tomorrow, they’ll do it all over again. At dinner that evening, Baumann and Bove, both PhD students in the Castillo lab at UNC, discuss their research over lionfish tacos. Why are they doing this work in Belize? Hundreds of species of coral can be found here, but Baumann is most interested in two species in particular — massive starlet coral (Siderastrea sidearea) and symmetrical brain coral (Pseudodiploria strigosa). These large mounding corals often act as a base for creating environments for other organisms to live and grow. 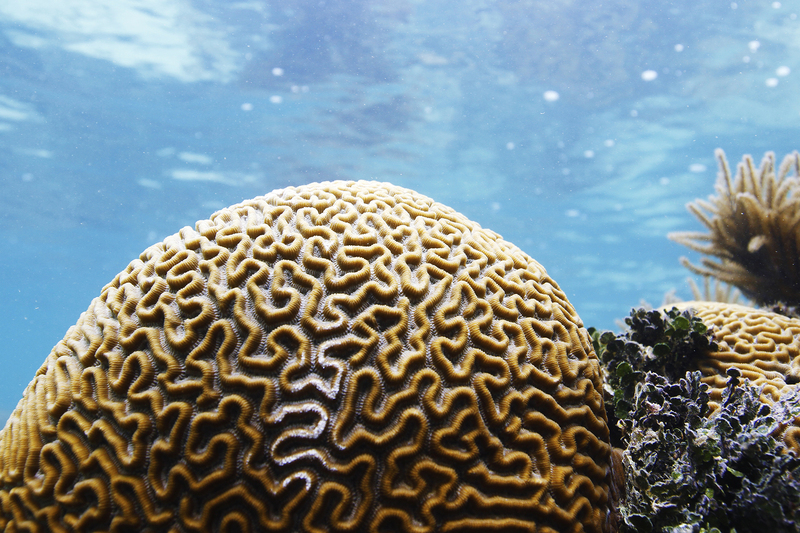 Symmetrical brain corals look exactly as their name suggests — a series of convoluted valleys and ridges, which are filled with a yellow-brown alga called zooxanthella that gives the corals their color. “If you think of a coral reef as a city, then these species are like the concrete foundation,” Bove says. For this project, Baumann teamed up with Fragments of Hope, a local non-profit based in Placencia, Belize, to access two research sites — one near-shore and one off-shore. The team plans to collect six colonies of each species from both reefs, totaling 24 colonies of coral altogether. After they cut and label them, the group will transplant half the fragments of each species to a new reef to see how they grow in different conditions. While corals are generally vulnerable organisms, researchers think these two species are quite hardy — part of Baumann’s research is finding out just how resilient they are. Elaborate reef structures cover the coastline here — from a mile outside the harbor to 30 miles offshore. The reefs closer to shore tend to be more vulnerable to human influences — runoff from the mainland, higher levels of pollution, and increased boat traffic all negatively impact corals. Baumann has data from previous research that suggests these two species grow faster near shore, even though those areas are more prone to stress — why and how could that be? It comes down to adaptation versus acclimatization, according to Baumann. The former is genetic and often requires multiple generations to see significant change. “So, if we move it from a cold area to a hot area, it takes multiple generations for the species to be able to succeed in that hot area,” he says. Acclimatization is a faster process — changes occur within the lifetime of one individual organism. “That’s what we’re after here. If we can take a coral from a cool area and move it to an area that’s warmer, and it survives or thrives, that tells us that those corals have a little bit of plasticity.” This can make all the difference when it comes to surviving climate change. Baumann and Bove returned to Chapel Hill just before the holidays in December, but Baumann has stayed in close contact with his new colleagues at Fragments of Hope. 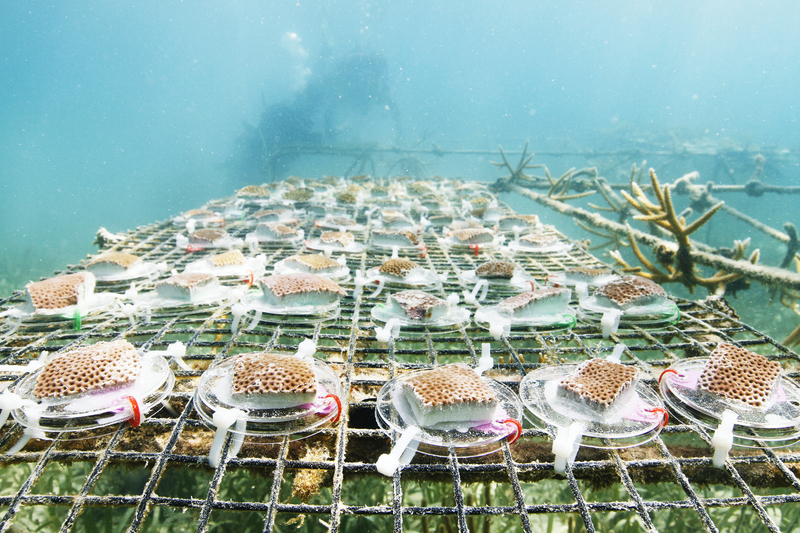 Their divers have checked on the corals they transplanted — all of which look healthy and happy so far. Over the next year, Baumann will return to Belize to check on the corals and track the progress of their growth. Justin Baumann is a PhD student in the Department of Marine Sciences within the UNC College of Arts & Sciences. Colleen Bove is PhD student in the Curriculum for the Environment and Ecology within the UNC College of Arts & Sciences.